Starting at the northernmost point of the peninsula and working our way south, just like the traditional changing leaves, we find a clustering of four fantastic Pinot Noirs. The Old Mission Peninsula is well-suited for growing many types of Pinot grapes, including Pinot Noir. Being surrounded by Lake Michigan and the bays gives this area a maritime microclimate that keeps it a little warmer in the fall and cooler in the spring. Paired with warm days of summer sunlight, this allows the wineries to create a true cool-climate Pinot Noir. The first stop is at 2 Lads Winery, where Pinot Noir is the fall favorite. The 2 Lads 2013 Pinot Noir is just the right balance of savory and earthy to pair with fall produce at nearby farm markets, and is structured enough to stand up to the cooler evenings. It’s also perfect to relax with after enjoying the bright colors of autumn while watching the sun set over the bay at the scenic overlook. Moving south along the peninsula to Chateau Chantal, we find them busy cooking up a fall feast featuring a warm mushroom, herb and cheese tart to enjoy with the Chateau Chantal 2013 Pinot Noir. Fall-inspired cuisine calls for a warming red with ripe fruit and spice notes such as Pinot Noir, perfect after returning from a walk through the trails at the Pyatt Lake Nature Preserve. The stunning fall color sets a beautiful backdrop for a relaxing hike through this area, known as one of the most botanically diverse spots in Northern Michigan. 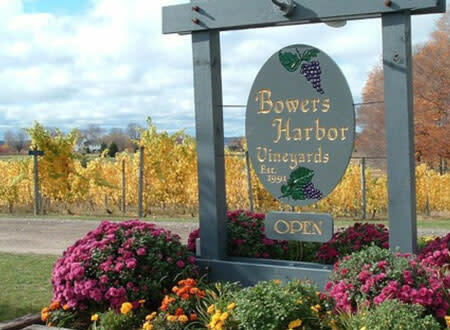 The next stop is Bowers Harbor Vineyards, a fall color destination in itself, like many of the wineries and vineyard properties on Old Mission Peninsula. Overlooking the large maple trees as the leaves turn, grilling venison tenderloin, sipping wine and savoring the local cuisine is a favorite at Bowers Harbor. Their 2013 Pinot Noir pairs perfectly with a venison loin stuffed with blue cheese crumbles and topped with blueberry chutney. The raspberry, cherry and blueberry fruit flavors complement the dish while the toastiness from the new French Oak barrels selected for the 2013 Pinot Noir brings out the smokiness from the grill. After an afternoon spent outside enjoying the fall air and raking leaves, the folks at Brys Estate Vineyard & Winery suggest the Brys Estate Pinot Noir. The earthy flavors combine with dark cherry flavors to create a silky smooth wine that warms you from the inside. 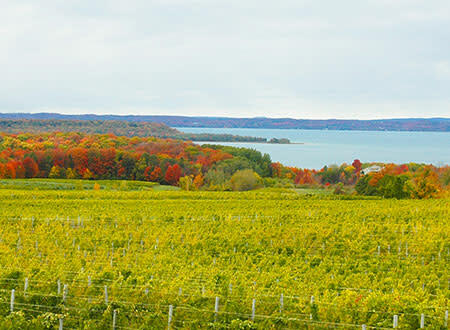 This wine is the perfect complement to a stroll on the Brys Estate Bridge Above the Vines, where you can enjoy sweeping views of 30 acres of vines cascading down toward East Grand Traverse Bay and fall colors exploding everywhere you look. Continuing along the peninsula, we stop at Chateau Grand Traverse to taste the recently-released 2012 Chateau Grand Traverse Cabernet Franc Reserve. This long-awaited staff favorite is beautifully structured with black pepper, dark chocolate, and hints of coffee. 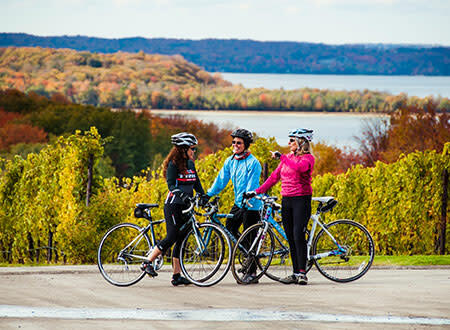 It’s a perfect way to stay warm as the weather starts to change, or when returning from a bike ride to take in the spectacular views of both bays lined with vibrant fall color. During the crisp fall months, the staff at Peninsula Cellars enjoys sharing their popular mulled apple wine. Made by mixing the Kroupa Orchards Apple Wine, made entirely with fresh Michigan apples, with mulling spices and a bit of sugar…all of the best flavors and aromas of fall fill the tasting room. It’s also the perfect treat to bring to a harvest gathering or tailgate party. 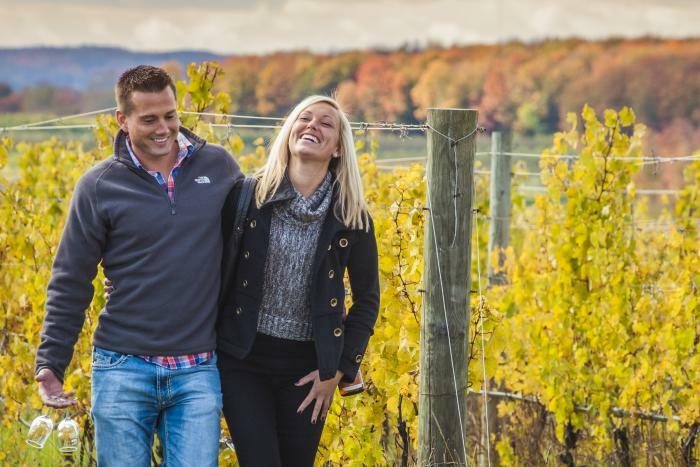 Speaking of tailgating, the staff at Peninsula Cellars can usually be found cheering on one of their favorite Michigan teams during the fall; when they can get away from the winery of course. Like the changing colors of the leaves, Hawthorne Vineyards is also changing colors, putting away the chilled crisp white wines and thinking of the reds, specifically the 2013 Lemberger, whose splashy raspberry notes blend with the characteristic black pepper. 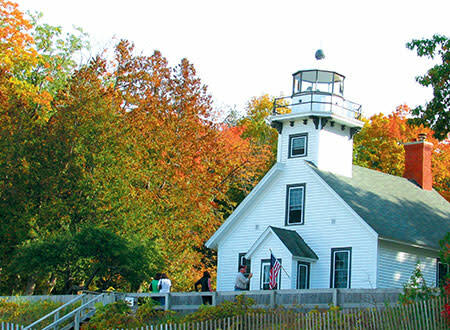 This wine is perfect with roasted chicken -- and while the chicken is roasting, take a drive up to the tip of Old Mission Peninsula to visit Mission Point Lighthouse while enjoying the incredible fall colors of the surrounding trees. The staff at our last stop, Black Star Farms, suggests picking up a bottle of the Black Star Farms Apple Cherry Cider. Enjoy this fruity yet refreshing cider after an afternoon exploring fall color from a different vantage point -- the water! A fall kayak tour of Old Mission Peninsula is the perfect way to stay active yet relax and enjoy the changing colors. This cider will bring back memories of the warm July days when the peninsula is abuzz with cherry harvest, yet offer a taste of the crisp and colorful autumn.